If any of the above variables/data is incorrect, then the outcome of the payroll process will be incorrect. In order to ensure an accurate payroll, the above variables must be correct for all employees. Now imagine that the above variables (input data) need to be managed for 1,000 or more employees, and for multiple pay periods, the task of running the payroll becomes very complex and error prone. Yes, using an automated payroll system will make processing the payroll easier, however it still does not ensure that the payroll input variables/data will be correct as the definition of these variables involves manual tasks. And conducting manual tasks can result in data gathering and recording errors. Having said that, in order to improve the payroll process, we need to improve the definition, gathering, and recording of payroll variables – Payroll Input Data. In this blog, I shall discuss how we can reduce the errors in payroll input data through planning and establishing effective payroll policies and controls. By reducing the number of errors in the payroll input data/variables, we will drastically improve the payroll process/outcome. It should be understood that the quality of the payroll outcome is directly linked to the quality of the payroll input data. If there is large number of errors in the payroll input data, this will negatively impact the quality of the payroll process/outcome. Thus, we need to focus on how to reduce the number of errors in the payroll input data. Payroll Variables/Input Data can be categorized into two categories based on the frequency of change, (1) Frequent Change, and (2) Less Frequent Change. Input data that changes frequently are the timesheet and leave data. While employee baseline data such as employee address, baseline compensations, etc., that affect the payroll changes less frequently. The table below shows the frequency level of change for each type of payroll Input data. Employee Baseline Data – This is the employee personnel record which includes employee demographic data, address, organization unit and job, and compensation data which includes earnings, allowances, benefits, bonuses, and commission, standard recurring deductions, and taxes. This type of data seldom changes and it changes due to an HR action. This type of data is non-pay period (NPP) based. Timesheet, Leave, and Exception Data – This data changes from pay period to pay period. Employees supply their timesheet at the end of each pay period to derive absent time, overtime, and labor distribution as well as leave taken during the pay period. Exception data is used to calculate a onetime compensation or deduction during the pay period. This type of data is pay period (PP) based. We can reduce the frequency of changes of NPP data, while we cannot control the frequency of PP data. Reason is that PP data has to occur every pay period (e.g., Monthly, Semi-Monthly, Biweekly, or Weekly). We cannot control the volume of the data to be collected or changed, but we can control the frequency of data collection and specifically the frequency of data change. Example, in the case of PP Data, if we have 1000 employees, then we need to collect 1000 Timesheets at the end of each pay period. The data volume in this case is 1000 Timesheets, and the frequency is 1 collection time per pay period. If the pay period is weekly, then we need to collect 1,000 Timesheets per week, which means four to five times per month depending on the month. In this case the frequency of data collect (1,000 Timesheets) is 4 to 5 times per month. By converting the 1,000 employees from weekly pay period to monthly pay period, we will decrease the frequency of data collection from 4 to 1 time per month. Thus, drastically reducing the error rate of the payroll input data. Let’s say that the error rate in reporting and entering 1000 Timesheets is 2%, so each time we collect and enter 1,000 timesheets, we will end up with 20 errors per week, or 80 errors per month. However, If the employees are on a monthly pay period, we will have only 20 errors, so we have reduced the total number of errors by 75%. To stay on the conservative side, let’s assume the cost of correcting each error is $50, leading to a total cost of $4,000 to correct 80 errors if employees are on the weekly pay period, however, if employees are on the monthly pay period, then the total cost of correcting the errors is $1,000. Thus, a saving of $3,000 per month or $36,000 per year. Similarly, the same reasoning can be applied to leave data which impacts the payroll. By establishing sound policies, we can reduce the volume and frequency of leave requests per pay period. Instead of allowing the employee to apply for leave anytime, we can institute a leave policy that reduces the volume and frequency of leave requests, where leave requests are scheduled for specific periods in the year. Example employees can only apply for leave on certain months of the year and the leave (vacation/annual leave) cannot be broken down. By doing so, the volume and frequency of leave requests will be reduced, thus reducing the volume of Payroll input data, and reducing the payroll input data errors. Similar approach can be used when dealing with NPP data. Note again that the objective is to reduce the volume and frequency of Payroll Input Data, thus reducing the Data Error Rate. In the case of NPP data, we can establish sound policies to limit the number and frequency of HR Actions that affect the payroll. Example, instead of having an ad hoc HR Action process in place, we can establish a systemic HR Action process, where employees can only be hired on the 1st of each month, and any change to employee compensations and benefits can only be effective on the 1st of the month. By implementing these simple policy changes, we reduce the payroll input data volume and frequency, and thus reducing the number of Input Data Error, which improves the payroll process. Reduce the frequency of change to employee baseline data by implementing a scheduled change to employee baseline data outside the payroll run cycle. Reduce the number of HR Actions that affect the payroll by implementing a scheduled HR Actions outside the payroll run cycle. Use monthly pay period for all employees to reduce the number of timesheets that need to be produced and processed, and reduce the number of payroll runs. If not possible to have all employees on monthly pay period, use semi-monthly pay period. Use one single pay period type (Monthly, Semi-Monthly, Biweekly, or Weekly) for all employees. Do not use multiple pay period types. Use time and attendance devices (e.g., Biometric Clocks) to gather and process data when dealing with large volume of data such as the Timesheets. This will eliminate data errors due to manual gathering and recording of data. The root cause of most of the problems associated with the Payroll Process is the quality of the Payroll Input Data. There is a direct correlation between the Payroll Input Data Quality and Payroll Outcome quality. Therefore, to improve the Payroll Process, we need improve the quality of the Payroll Input Data. To improve the quality of the Payroll Input Data, we need to reduce the volume and frequency of data gathering, recording, and data entry. 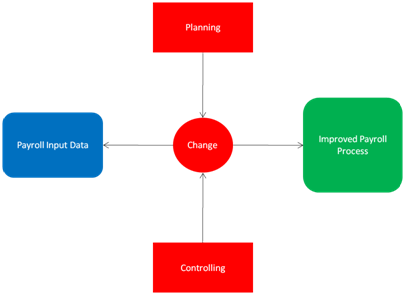 To achieve this, we can implement simple policies that reduce the volume and frequency of input data changes and implement planned and controlled change of the Payroll Input Data. By doing so, and using effective Integrated Time & Attendance, Leave Management, and Payroll System such as Interact HRMS, you will achieve a drastic improvement your organization payroll process, leading to timely and correct payroll process outcome and large cost savings.